The Höfner Shorty Bass CT Black is a 4-string bass guitar, featuring an Asian maple neck, a rosewood fingerboard, and a high gloss black finish. The Hofner Shorty was first produced back in the 1980s and Hofner continue to offer this compact travel guitar for those bassists who can't bear to be without a guitar even when on holiday. The Hofner Shorty offers full scale length combined with such small overall dimensions that it can be taken anywhere. Constructed with a basswood body, this bass has an Asian maple neck connected to a rosewood fingerboard that features 24 frets and dot inlays with a metal bridge and fixed tailpiece. 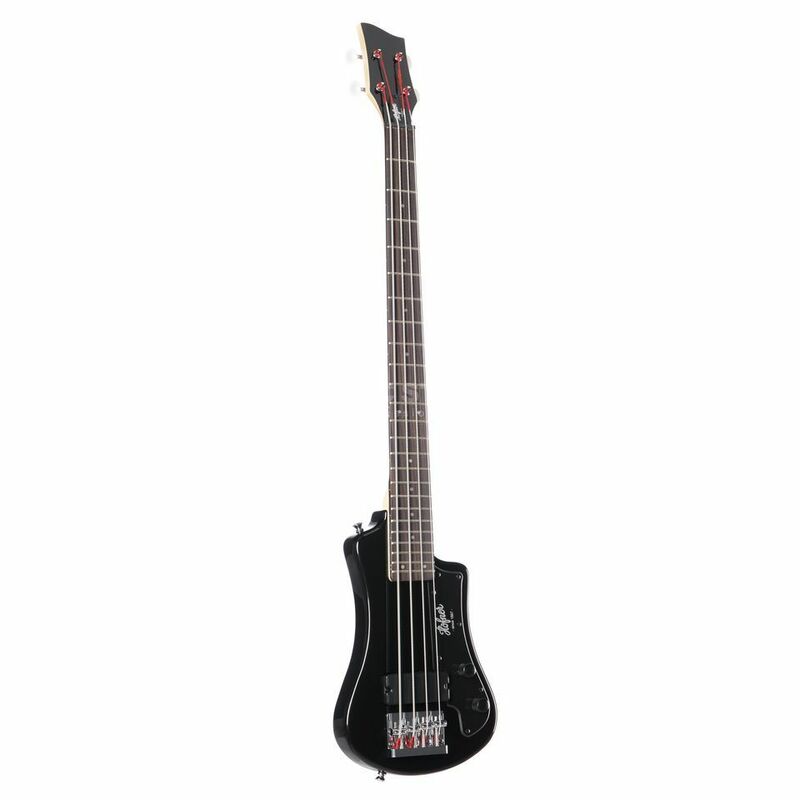 I bought this shorty bass as a practice guitar for playing in bed, on a sofa or in any other comfortable position that a regular bass just wont fit. Its small size is perfect for carrying around with you, and the bass has a very good sound to it. The action was set a little high when the bass arrived but that was quickly changed. The case which comes with the guitar is very similar to an air rifle case. In fact, I think it probably is an air rifle case that has Hofner stitched on to the pocket. The only negative thing I have to say about the Hofner Shorty Bass is its weight distribution. The guitar is very top-heavy. I have attached a small weight to the bottom of the guitar strap to provide more weight to the body of the bass which fixes the problem. Very good value for money, very impressed by the quality of the guitar. I would recommend the Hofner Shorty Bass to anyone looking for a good practice or starter bass. It would even do well in a live performance. If you buy one of these guitars, take 5-10 minutes to get used to the weight displacement. Give the fretboard a clean with some lemon oil. Maybe lower the action if you need to. The tool kit which comes with the bass contains two allen or hex keys for adjusting the bridge. The bit I like most about the Hofner Shorty is the exceptional build quality for something with such a reasonable price tag.